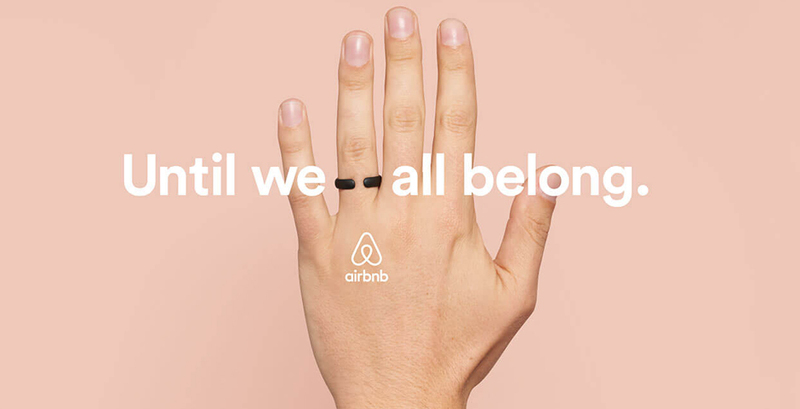 In 2017, Airbnb set out to lead a mass conversation on Australian Marriage Equality with the aim of reigniting conversations about the issue and driving real world social change. Launching in April, #UntilWeAllBelong was a simple idea centered on an incomplete wedding ring representative of the gap in equality the county faced. The idea was to create something that would go beyond the usual short term spikes in conversations that these campaigns often cause, and actually have a genuine impact on the fight for marriage equality. An integrated campaign drove over 110,000,000 media impressions, so becoming the largest corporate push for Marriage Equality (and any LGBTIQ issue) in history. Airbnb believe in creating a world where all 7.4 billion people feel as though they can belong anywhere. Whether that’s supporting refugees, championing women's rights or standing against racial discrimination, everyone should feel welcomed no matter where they are, or where they are going. Australia is one of Airbnb’s most important markets and yet the country was not living up to the core brand values on which Airbnb is built. This is why Airbnb felt compelled to throw their support behind Marriage Equality - they believe in living their brand values, not just talking about them when it is convenient to do so. When, in November 2016, the Government voted against a national plebiscite on Marriage Equality, many people felt the issue would not be revisited in the near future. Airbnb saw this as a time when, more than ever, there was a real opportunity for socially responsible brands to help keep this issue in the spotlight and ensure pressure was maintained on the Government. Whilst in other westernised countries Marriage Equality is no longer seen as a controversial topic, here in Australia it was still proving highly divisive, both politically and socially. For all other brands in Australia, this was enough to keep them from taking a stance on the issue. For Airbnb however, there were no concerns about being the first to put their head above the parapet – they believe in living their purpose and had no qualms about taking a stand on issues others may shy away from. Our goals at the outset were simple, but ambitious. Airbnb committed that they would not stop supporting and campaigning for Marriage Equality – until all Australians could belong and have their love seen as equal in the eyes of the law. Many organisations and people had fought long and hard to see Marriage Equality become law in Australia. When, at the end of 2017, this finally happened, it was an enormous moment in the country’s history. To have been an important part in the movement that helped shaped the future for LGBTQI Australians is something Airbnb are enormously proud of. The first, and most important, ‘a-ha’ moment came in the early stages of this project, when we identified what we needed to achieve and how the project would need to come to life if we were to be successful. The strategic leap came in understanding that we needed to turn this from a societal issue to a personal one – that nearly all Australians would know someone personally affected by this lack of equality – and to get them to see it as a personal issue, even if they were not a member of the LGBTQI community. We needed to Marriage Equality from a ‘gay issue’ to a ‘human rights issue’. The other part of that was understanding that we needed something that could live beyond a short-term spike in PR, and that could operate as an enduring symbol. With no idea as to how long this campaign may have needed to run before equality was achieved, we needed something that could operate in the long term. Out of this understanding of how to frame the problem, the #UntilWeAllBelong campaign commitment was born. As technology becomes ever more integrated into projects, it’s important to remember that the more things change, the more they stay the same. What is fundamentally important to people doesn’t really change. What intrigues and engages people doesn’t really fundamentally change. As technology jumps forwards in leaps and bounds, we need to remember to keep the humanity at the heart of our projects, and to find genuine societal issues where brands can stand up and make a real-world difference.